Houseplants add a color and air cleaning properties to any room. However, when small children and pets are around, houseplants may be a poison threat. A number of common houseplants have toxic properties that can cause serious complications if ingested. Utilize nontoxic houseplants for homes with pets and small children to avoid complications due to houseplant poisoning. 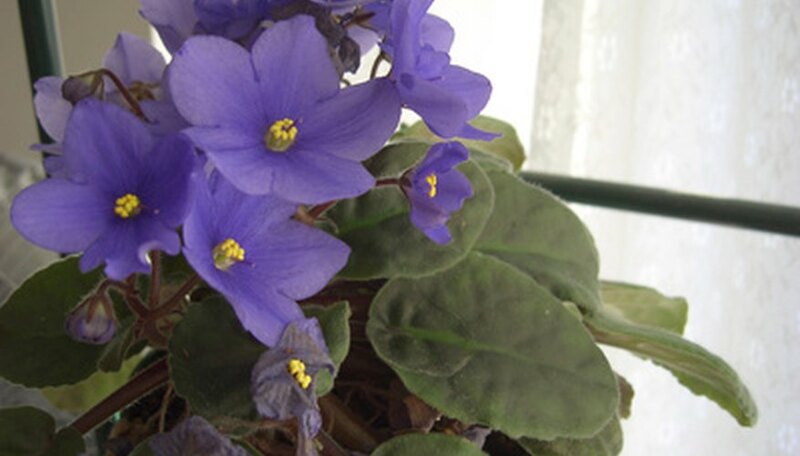 African violet (Episcia reptans) is a popular houseplant because it is one of the few flowering plants that will grow indoors without supplemental lighting. As an added bonus these compact flowering plants are nontoxic to cats, dogs and small children. They feature an array of colors including purple, white, red and pink as well as dark green textured foliage. According to the University of Florida Extension, African violets require bright light but not direct sunlight for the best blooms. In addition, African violets prefer well-drained soil and cool temperatures. African violets are native to Tanzania as well as Africa. According to the ASPCA, bridal veils are nontoxic to both cats and dogs. Bridal veil (Tradescantia multiflora) is commonly used in hanging baskets and small flower pots. The plant grows in a vine pattern and is easy to root. Bridal veil features small dark green foliage and tiny white flowers that resemble baby’s breath. They enjoy filtered sunlight and well-drained soil. Look for bridal veil at nurseries or greenhouses where they are commonly sold in large hanging baskets that can be placed on a covered porch during the summer and brought indoors during the fall and winter seasons. Tradescantia multiflora is a Jamaican native plant where it grows outside as a perennial. Jade plants (Crassula ovata) are one of the most common houseplants. This succulent plant features interesting and fleshy green oval shaped foliage and thick branches. They are easy to cultivate from stem or leaf clippings. In addition it will tolerate long periods without water. The University of Nebraska Cooperative Extension lists jade plants as nontoxic for small children. However, the plant is also safe for household pets such as dogs and cats. Jade plants are native to Southern Africa, specifically the Eastern Cape area. Ponytail palm (Beaucarenia recurvata) is a popular houseplant that originated in Mexico. This nontoxic houseplant is easy to grow because it will tolerate a variety of soil conditions. It is interesting because of its large bulbous base and green grasslike foliage. Like jade plants, the ponytail palm does not need a lot of water. However, the ponytail palm does require full sun.